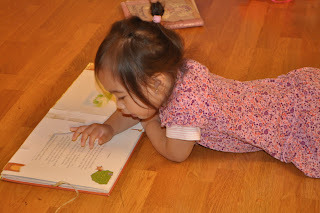 Just About Anything: Mommy Moments: A Bookworm Like Me? My little girl loves books. Although she cannot read yet, she can already recognize some shapes, numbers and images of animals and other things. She would point at them and then she would tell me what it is. She would sometimes even make the sound of the animal if I point an animal. Reading her first ever nursery rhymes book that is now torn. The pop-up stage is no longer there. What is left is a big hole. When she was smaller, she would tear the pages apart or bite on the spine. It was quite frustrating and so I made sure to buy her board books. She books of different sizes and colors, some in English, some in German. 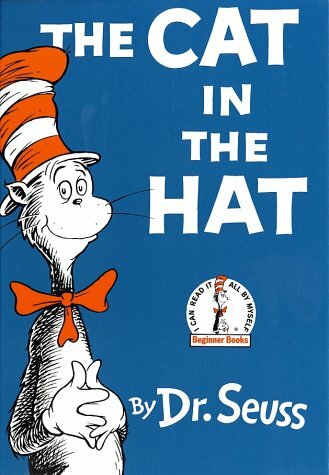 Her latest favorites are: The Cat In The Hat by Dr. Seuss and Märchenkiste (a Disney fairytale collection). The first I purchased on amazon and the second one, a gift from her friend. She would always refer to them as BOOK and wouldn't go to bed without them. She would also bring it along with her when we go out. There was even a time when she threw a fit because we forgot to bring her book. We had to go all the way home just to fetch her book. She loves looking at the pictures in the books and I sometimes see her talking to herself, pointing at the pages and the images, as if reading a story. great job mommy... you are raising a bright child! Alam mo Marce, ganyan din mga anak ko eh, pinupunit ang mga pages ng book, kaya ng binibili ko yung matitigas ang cover, or yung makakapal ang pages, para ke Alex, now favorite nya ng bible book na bigay ng biyenan ko. Katuwa naman si Sam, talagang loves na loves nya ang book nya..
that is such a nice start. keep it up! How adorable! She looks so serious! Better she's interested in books than playing with gadgets. aw cute. at least diba kahit nakikita nila tayong laging nakaharap sa computer, interested pa din sila sa books. kaso pag nalaman nila na pwede na silang magbasa sa net, nakup. hahaha!